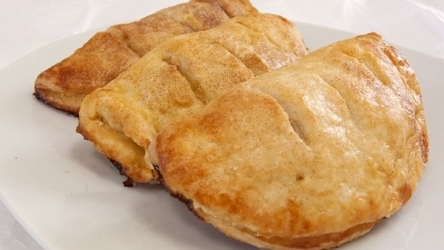 Cheese Turnovers are an Armenian food recipe of fried cheese stuffed dough. Mix flour, egg, water, oil and salt together and knead. Divide into two balls, cover, and set aside for 1⁄2 hour. On a floured surface, roll out each ball 1⁄8 inch thick. Cut out 4 inch disks of dough. Mix cheese, parsley, onion, salt, pepper and red pepper thoroughly. Place 1 tablespoon filling in the middle of each dough disk. Fold dough over and seal edges well with moistened fingers. Repeat with the remaining dough and filling. 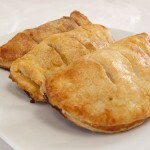 Heat oil and fry turnovers, a few at a time, until golden brown on both sides.